St Edward’s Church in Leek is a church community that meets in a beautiful medieval building but has a contemporary mission. freedom for the prisoner …. sight for the blind …. liberty for the oppressed ….. This is an informal service consisting of prayer, a short talk on healing and the opportunity of the laying on of hands for anyone who wishes to receive it. Children are welcome to use and explore the Children’s area on left hand side of church which is stocked with simple crafts, drawing materials, a selection of books and a variety of story sacks themed on various bible stories. Usually on the 2nd Sunday of each month at the 9.30 a.m. service, to coincide with Baptisms, there are activities laid on led by our children’s leaders. After the first hymn children aged 3-9 years are invited to join them in the Sunday Club room above, where there is teaching and activities explaining baptism, along with crafts. The children are returned to the service to see the baptism take place and then, if they so wish can continue to finish their crafts upstairs. The Parlour, at the back of the church, is a sound proof room, having the service piped through for listening to as younger children play with a box of toys suitable for their age. This can be used as a crèche and access to the baby changing facility should parents/carers wish. 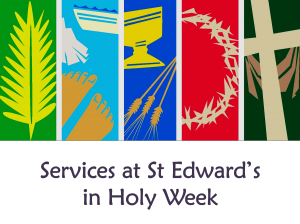 The group meets every Wednesday during term time between 1.45-3.30pm at St Edward’s Church. A warm welcome is assured to everyone of all religious backgrounds or none. We have a variety of stimulating toys and activities for babies and children up to 4 years. On arrival the grownups have a chance to enjoy a hot drink whilst the children play and join in with action songs. We then move up into The Children’s Room, where we all sit to listen to a Bible story told in an engaging style using props and models. Following a short Bible reading and prayer, we then share our feast together, of drinks and biscuits. Then it is time for more toys and free play as well as an activity that relates to the story – something messy like painting, sticking or tipping and pouring. We ask a contribution of £1 per first child and 50p for each sibling, which includes drinks and biscuits. There are toilets and facilities for nappy changing and bottles can also be warmed up in our fully equipped kitchen. Our group is run by members of St Edward’s and a warm welcome is assured to everyone coming along. For more information please contact Christine 07761538666 or Sheila 07929888259 and find us on Facebook at Leek Story Finders. Our Fellowship Groups provide the opportunity for prayer and bible study in small, friendly and welcoming groups. Hosted in the homes of congregation members, the format is informal and flexible – allowing discussions to be relaxed and helpful. We’re all about learning from each other, deepening our understanding and developing great friendships!